Bigfoot Flags - The Name Says It All. If You Need To Grab Attention, This Is A Great Choice. Our Bigfoot Flags come in sizes from 8' to 14'. With the pole package, the 14' kit stands at a staggering 17' tall. Bigfoot Flags are vertical flags with a pole sleeve running the length of the left side. The top and bottom are completely free flowing to give the Bigfoot the waving properties of a flag. Typically installed into a Ground Stake this flag grabs attentions from anyone nearby. The Bigfoot Flags are similar in look to our Cobra Banners. The difference between the Cobra Banners and the Bigfoot Flags is the top horizontal edge is not held stiff by a rod. The Flag flies freely with the wind. The light polyester materials we use on these flags are long lasting but will also fly well in light breezes. 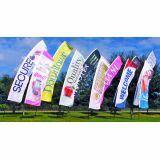 Tuff Flags offers a large variety of shapes and sizes for advertising flags and banners for you to choose. If this is the right look for you, order now. You will receive a commercial-grade product, fast shipping, expert printing on industrial caliber printers, and the best prices in the market. 100% Customer Satisfaction Guarantee. These flags fly well in light breezes, are easy to read, and creaate eye-catching movements only possible with flags. The designs are colorful and UV resistant. The Bigfoot Design can be printed with your design in full color or you can choose hundreds of stock versions. Bigfoot Flags come in 3 sizes. These poles are intended to be used on OEM hardware. If the Bigfoot is the style you've been looking for, order here at Tuff Flags. If you would like to discuss these flags versus other advertising flags and banners please email us at Customercare@tuffflags.com, chat with us on Live Chat, or call us at (888) 287-3524. We appreciate the opportunity to help in any way..